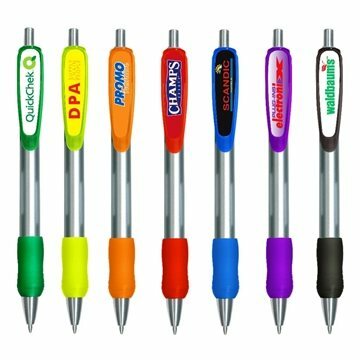 Featuring a plunger style design, silver barrel and colored rubber grip, this innovative writing implement writes in black ink. An ideal giveaway at trade shows, fundraisers and conferences. Our customers love the item. We had our logo imprinted on the item to remind customers of us. Thank you AnyPromo for helping me promote my company. I liked both the quality and the style of the product. Good fast and quality work! this is a great small give-a-way that is affordable and useful! We used this for a youth event. Rose did a fantastic job with getting us quotes on our rush order. Thank you ! I have been very satisfied with your services. the art department did everything I asked to make it just the way I wanted it before it went to print.